The Japan Center for International Cooperation in Conservation has been involved in the “Support for documentation standards and procedures of the Silk Roads World Heritage serial and transnational nomination in Central Asia” promoted by the UNESCO Japanese Funds-in-Trust since 2011. To support the collective listing of the Silk Road related assets expected by the five countries in Central Asia, this project is jointly implemented by research institutes in Japan and the UK. After “the Chang’an-Tian-shan Silk Road Corridor” nominated jointly by Kazakhstan, Kyrgyz and China was listed as a World Heritage Site in 2014, another application made jointly by Uzbekistan and Tajikistan, and one more by Turkmenistan alone are expected as well. However, there is still an issue to be settled: establishment of a sustainable management system for cultural properties under close cooperation among the five countries. Therefore, UNESCO has decided to continue to provide support by implementing Phase 2 of this project from 2014 to 2017. From October 2 through 10, the Japan Center for International Cooperation in Conservation in charge of Kyrgyz organized a workshop to improve the documentation technique for cultural properties focusing on archaeological and architectural remains, as well as to prepare management plans for the heritage, in Uzgen, the southern part of Kyrgyz. First, we gave lectures on techniques to prepare distribution maps of ruins by using a GNSS (Global Navigation Satellite System) receiver and GIS (Geographical Information System) software, topographical survey for archeological sites with aerial photographs taken by a small UAV (Unmanned Aerial Vehicle) and 3D modeling software, and high-resolution 3D modeling of architectural heritage, which were followed by a field survey. Then, we simulated the preparation of management plans for cultural properties as group work. Participation of the Japan Center for International Cooperation in Conservation in this project ended this year. 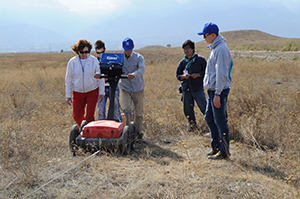 The GNSS receiver, small UAV and other equipment used for this workshop have been provided for Kyrgyz by UNESCO. 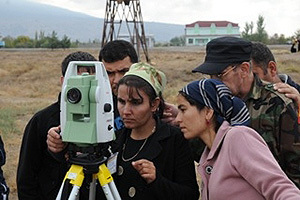 We expect that documentation of the cultural assets using these latest devices will be promoted further in Kyrgyz. 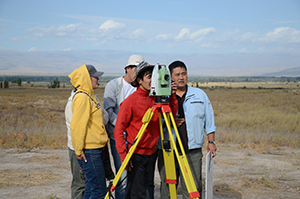 Since 2011, the Japan Center for International Cooperation in Conservation has been collaborating with efforts to protect cultural heritage in the Kyrgyz Republic and the countries of Central Asia, based on the framework of the Agency for Cultural Affairs’ Networking Core Centers for International Cooperation on Conservation of Cultural Heritage Project for the Protection of Cultural Heritage. Previously, workshops to develop human resources have been held in the field of protection of cultural heritage, such as documentation, excavation, conservation, and site management. This year is the final year of this project, and in July inspection tours and workshops were conducted on site management and museum exhibition in Japan. Later in the year, over the six days from October 27 to November 1, the 8th workshop “Training Workshop on Exhibition and Publication of the Excavation Report” was held in Bishkek, the Kyrgyz Republic. Twelve trainees from Kyrgyz participated in this workshop. At present, museums in Kyrgyz still lack adequate facilities and human resources. Therefore, this workshop featured lectures on exhibition techniques at museums, management of lighting, temperature and humidity, and exhibition hall management techniques. After that, there were lectures and training on techniques for preparing site reports, including topics such as drawing of archaeological finds and descriptions of their attributes. In addition, due to the diversification of archaeological investitgation techniques in recent years, today’s reports contain various types of natural science approaches. 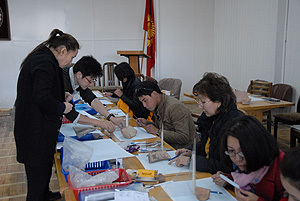 Therefore, lectures were given and training carried out regarding analytical techniques for animal and plant remains sampled from Ak-Beshim, where excavation training was conducted in 2012 and 2013. This will be the final workshop held under the current framework. However, considering the current situation in Kyrgyz and Central Asian countries regarding museums, conservation facilities, and site management, there remains a need for international support in all areas of cultural heritage protection. Going forward, the Japan Center for International Cooperation in Conservation plans to continue its efforts in various international cooperation projects for culture heritage, with the aim of protecting cultural heritage in Central Asia. The Japan Center for International Cooperation in Conservation (JCICC) has been commissioned by UNESCO to provide support for nomination of World Heritage sites in Central Asia along the Silk Road. Since 2012, JCICC has conducted a series of training workshops on documentation of cultural heritage in Central Asia and the Republic of Tajikistan. Following a workshop in 2012, a second training workshop was conducted jointly with the Ministry of Culture of the Republic of Tajikistan. The workshop took place from November 7 to 14, 2013. Training during the workshop took place on-site at the Hulbuk site, a medieval fortified town nominated as a World Heritage site. On-site training was conducted by experts from Japan, and training consisted of surveys using equipment (total stations), documentation using CAD, analyses using GPS and GIS. Trainees participating in the second workshop were 9 young Tajik experts. Of these experts, 2 were from the National Museum of Antiquities, 2 were from the Institute of History, Archaeology and Ethnography of the Academy of Sciences, 1 was from Historical and Cultural Reserve “Hissar”, 3 were from the Hulbuk Museum, and 1 was from the Kulob Museum. Through intensive lectures and practice over a period of about a week, participants planned and implemented surveys to document sites and they learned specialized processes used to analyze the survey results. Participants also learned how to use survey equipment and GPS devices that had been donated for use in the project. This experience and the equipment that was provided will help participants who completed the training to study, safeguard, and document cultural properties in their country. JCICC plans to conduct various training workshops to safeguard the cultural heritage of Central Asia in the future as well. Since 2003, the Japan Center for International Cooperation in Conservation has conducted the ‘Safeguarding of the Bamiyan Site’ project in close cooperation with the Ministry of Information and Culture, Afghanistan and Nara National Research Institute for Cultural Properties, Japan. Our mission was on hold for three years after 2010 due to security issues in Afghanistan, but a short-term 11th mission was finally dispatched from September 28th to October 6th of this year. This mission sought to compensate for the 3-year hiatus by confirming the current state of cultural heritage and landscape in the region. This work involved five activities. First, the state of the Buddhist caves and mural paintings was surveyed. Second, environmental data from the past few years, including meteorological data from the Bamiyan Valley and temperature and humidity data from the caves, were collected. 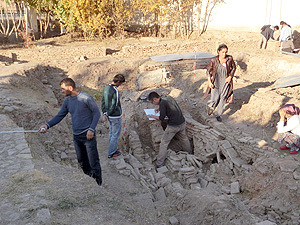 Third, general surveys of archaeological sites in the Bamiyan and Foladi Valleys were conducted. A survey of the Foladi Valley revealed a new Buddhist cave that might date to the latter half of the 6th century AD. Fourth, basic information on the landscape at a planned museum construction site was collected. The site is to be the home of a new Bamiyan museum constructed with the help of Mukogawa Women’s University, Japan. Fifth and finally, lectures on the history and culture of the Bamiyan site and previous conservation activities at the site were conducted for students of Bamiyan University, attracting a considerable number of attendees. The one-week mission yielded limited results, but the fundamental data obtained will serve as the basis for a research plan for the next mission. In addition, the considerable interest of students in the Bamiyan site promises the appearance of a new generation of ‘guardians’ of cultural heritage in Afghanistan.